"This was created out of ingredients I had in my fridge before heading on vacation. Amazed at the outcome and my hubby was sad there wasn't more. It's delicious! Experiment with the quantities since I really added what was already here in my kitchen at the time. I thought it would be dry, but it wasn't. As a precaution, I made a warm cheese sauce for adding on top while eating. It wasn't necessary, but it was delicious. Enjoy!" Preheat oven to 350 degrees F (175 degrees C). Lightly grease a small casserole dish with olive oil. Heat 1 tablespoon olive oil in a skillet over medium-high heat. Cook prosciutto in hot oil until crisp, 4 to 6 minutes per side. Drain cooked prosciutto on a plate lined with paper towel; pat slices with paper towel to blot excess grease. Crumble prosciutto. Spread about half the potatoes into the bottom of the prepared casserole dish. Arrange about half the mozzarella slices atop the potatoes. Repeat layering with remaining potatoes and cheese. Drizzle 1 tablespoon olive oil over the top layer of cheese. Sprinkle crumbled prosciutto over the cheese layer. 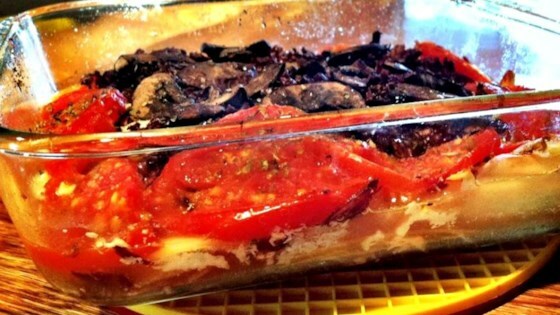 Arrange tomato slices around the edges of the casserole dish. Sprinkle mushroom slices inside the edges of the tomato border. Season with salt, pepper, oregano, garlic powder, and green onion. Cover casserole dish with aluminum foil. Bake in preheated oven for 50 minutes. Remove and discard foil and switch oven to broil. Continue cooking under the broiler until the top is browned, 5 to 10 minutes more.